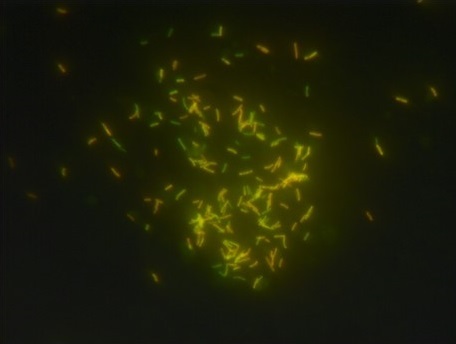 Smear microscopy is the simplest and quickest currently available procedure to detect Acid Fast Bacilli (AFB) in clinical specimens. Most common staning technique involve classic Ziehl-Neelsen (ZN) staining method or one of it’s variants. Now a days, these methods have been supplanted by more sensitive Auramine-Rhodamine Fluorescence staining technique, also called Truant method for acid-fast staining. Auramine and Rhodamine are nonspecific fluorochrome dyes that have an affinity for acid fast organisms. In case of Mycobacteria, the dyes can bind specifically to the mycolic acid contained in the cell wall allowing the penetration of the stain. This complex resists decolorization by acid-alcohol decolorizer solution. The counterstain, potassium permanganate helps to prevent nonspecific fluorescence, thus reducing the possibility of artifacts. When observed under the microscope with UV illumination, acid fast cells are yellow or bright orange against dark background. Dissolve 1.5 g of Auramine O and 0.75 g Rhodamine B in a solution of 75 ml glycerol (glycerine), 10 ml heated phenol crystals, and 50 ml of distilled water. This solution is usually cleared by filtering through glass wool. Carefully add 0.5 ml of concentrated hydrochloric acid to 100 ml of 70% ethanol. Dissolve 0.5 g of potassium permanganate (KMn04) in 100 ml of distilled water. Make a thin smear of the material for study and heat fix by passing the slide through the flame of a Bunsen burner or use a slide warmer at 65-75 C. Do not overheat. Flood smears with Auramine O-Rhodamine B solution and allow to stain for 15 minutes, making certain that the staining solution remains on the smear. Do not apply heat to smear. Rinse smears with chlorine free water until no color appears in the effluent. Chlorine may interfere with fluorescence; therefore, rinse with distilled or deionized water. Flood the smear with the decolorizing agent for 2 to 3 minutes, and then wash with distilled water. Flood smears with acid alcohol and allow to de-stain for 2 minutes. Rinse the slide thoroughly with distilled water and shake off excess fluid. Flood smears with potassium permanganate and counter stain for 2 minutes. Time is critical with potassium permanganate because counter staining for a longer time may quench fluorescence of acid-fast bacilli. Rinse thoroughly with distilled water and allow to air dry. Do not blot. Examine microscopically using a fluorescent microscope as soon as possible. Use a 20x or 40x objective for screening, and a 100x oil immersion objective to observe the morphology of fluorescing organisms. If desired, the slide can be directly restained using one of the other acid-fast stains (Ziehl-Neelsen or Kinyoun Stain). Negative Test : Non-acid-fast organisms will not fluoresce or may appear a pale yellow, quite distinct from the bright acid-fast organisms. If no fluorescent rods are seen, report the smear as AFB NOT SEEN. Reagents like Auramine-Rhodamine are possible carcinogen, Acid –alcoholand Potassium permanganate is also strong irritant to skin, eyes and respiratory system. Caution is required while handling and staining using such reagents. Turbidity may develop in the stain, but it will not interfere with the effectiveness of the stain. Shake the bottle before using. I have got more information from this slide.thank you so much! Are these stains have expiration date or how many months can you store this inorder to have a reliable results.